A Nation With Some Of The World's Highest Mountains Is Finally Starting To Ski : Parallels Despite Nepal's wealth of mountains, downhill skiing is not a popular sport. It's expensive and there's a lack of infrastructure for it. But enthusiasts are encouraging young people to try the sport. Doma Hyolmo, 15, carries skis during her first attempt at skiing in Kalinchowk, a village in the mountains of Nepal. While a few adventure tourists come to ski in Nepal, most Nepalese haven't tried the sport. The Himalayan village of Kalinchowk, sitting at an altitude of about 12,000 feet in eastern Nepal and known for its temple to the Hindu goddess Kali, gets snow every year. After a recent storm, the town's young people flock to wooden lodges and dance around campfires. 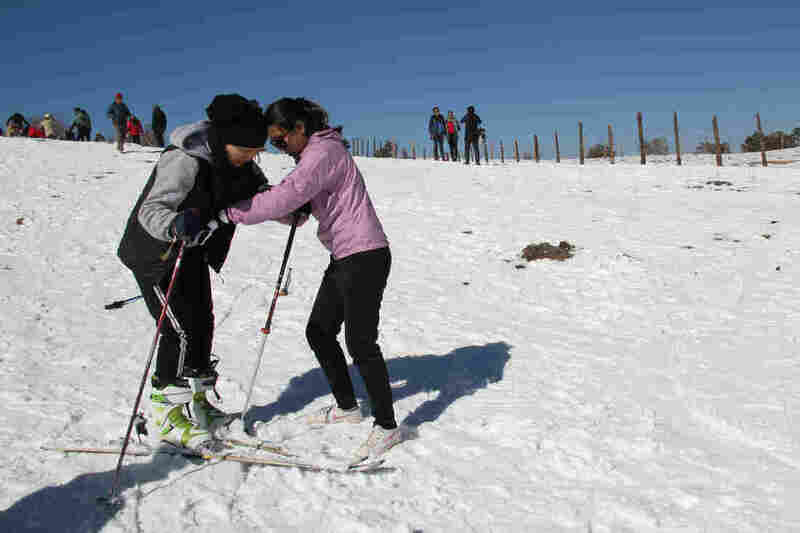 Utsav Pathak is determined to get some of them on skis. "In Nepal, nobody skis, I think," says Pathak. But he does. The 23-year-old entrepreneur — who started skiing in Nepal two years ago after seeing pictures on Facebook of a German friend skiing — is trying to encourage more people to try the sport through his Kathmandu-based nonprofit, the Nepal Ski and Snowboard Foundation. He has arrived from Kathmandu with skis and other equipment, and two busloads of people, to try to hook them on skiing here — the closest spot with some snow. Nepal is home to many of the world's highest snow-capped peaks, but downhill skiing is not a popular or well-known sport. The snowline is extremely high — somewhere around 15,000 feet, an altitude that carries health risks — and skiing requires either a lot of effort or a lot of money, more than most Nepalese can afford, especially for a recreational activity. Only a handful of people, mostly foreigners, currently ski Nepal's mountains, thanks to a few tourism companies. Some, like Heli Ski Nepal, offer high-end ski trips in the Annapurna and Everest regions. Fenchoke Sherpa (right), an instructor with the Nepal Ski and Snowboard Foundation, gives tips to Doma Hyolmo, 15, on her first attempt at skiing. Without basic infrastructure — like roads — in most of Nepal's high mountain areas, getting to the snow requires either trekking for days and lugging ski gear or paying for a helicopter drop. The country doesn't have a single ski lift. Chris Pollack, a U.S. Marine Corps veteran and co-owner of a Colorado-based adventure company, joined the company's Mera Peak trip last October, taking along his snowboard. His group hiked up for four days, and then skied or boarded down in 45 minutes. "It's not gonna look like Chamonix, France, or a Tahoe by any means," Pollack says. And that's part of Nepal's appeal for adventurer travelers, he believes. The lack of infrastructure offers a rare treat: "You can go pretty much anywhere in Nepal, you'd be the first one to ski that slope or that peak," he says. Adventure companies are exploring new terrain and higher peaks. But the high elevations come with safety concerns, like altitude sickness, which can be fatal. That's where local climbing guides, who know the dangers and can keep newcomers safe, come in. But to support these trips, they must become skiers too. Both the Nepal Ski and Snowboard Foundation and another company, Himalayan Ski Treks, have started training guides who typically work on Everest and other peaks to ski. Ski entrepreneurs like Pathak believe downhill skiing could open up tourism in Nepal's normally quiet winter season, increasing incomes for guides and hotel owners. 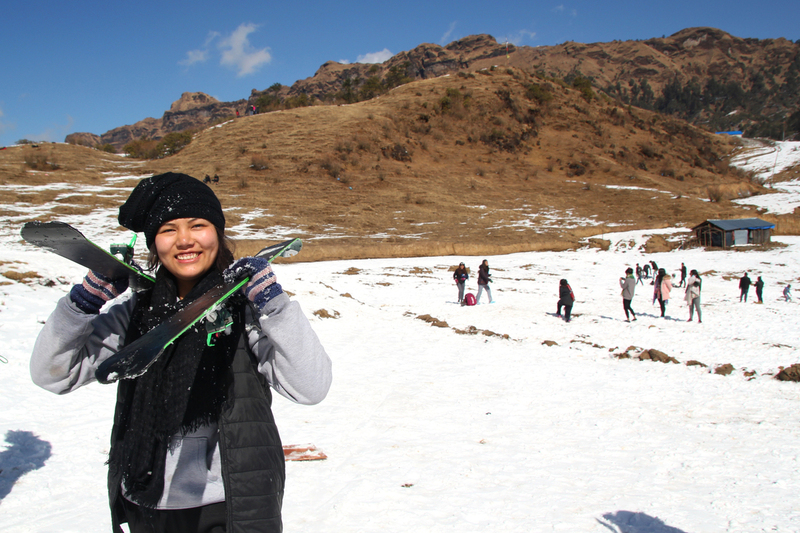 Back in Kalinchowk, 15-year-old Doma Hyolmo is getting on skis for the first time. Fenchoke Sherpa, a 22-year-old instructor with Pathak's Nepal Ski and Snowboard Foundation, guides her to point her skis in a "pizza shape," as she picks up momentum on a small slope. Sherpa has only had the chance to ski a few times herself. "My family business is trekking and mountaineering," she says. Her father was an Everest guide and agency owner, but she sees skiing as a possible future both for her family's business and tourism in Nepal. Pathak hopes young Nepalese will help drive a demand to set up skiing infrastructure in their country. For now, he's taken things into his own hands and is designing a surface lift, in which skiers remain on the ground as they're towed up a mountain, for Kalinchowk. He envisions snow machines in the future.